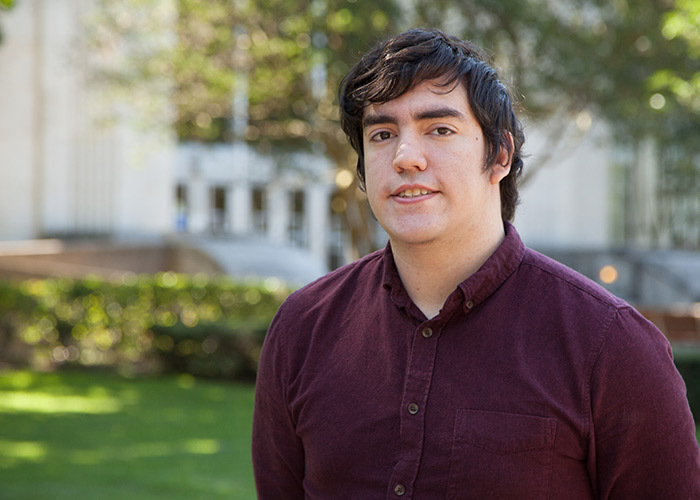 A University of Houston student working on his doctoral degree in applied mathematics has been selected for a graduate student research program offered by the U.S. Department of Energy. Kyle Williams is one of just 53 students in the nation chosen for the DOE’s Office of Science Graduate Student Research Program, and the only one working in applied mathematics. As part of the program, he will spend the summer at Sandia National Laboratory in Albuquerque, N.M., working with scientists there to further his research into developing methods to more accurately describe the movement of fluids. The award is designed to allow graduate students working in one of DOE’s priority research areas to collaborate with DOE scientists at a national laboratory. Williams studies computational fluid dynamics and Navier-Stokes equations, which describe the motion of viscous fluids. Working with mathematics professor Maxim Olshanskii in the UH College of Natural Sciences and Mathematics, he develops numerical methods and algorithms to solve the equations, seeking answers to improve the accuracy of the equations by better accounting for the preservation of mass and energy, as well as ways to more quickly solve those equations. The work has applications for the oil and gas industry, aerospace and other fields that require the simulation of fluid flow. Olshanskii said the research area of multiscale numerical methods for fluid flows is both challenging and competitive. The award will allow Williams to collaborate with DOE scientists and master his skills in mathematical modeling and to apply his approach to practically relevant problems, Olshanskii said, as well as giving him an opportunity to use the national lab’s high-performance computing resources and the scientists who work to develop the lab’s noted scientific and computational software.